A near-death experience (NDE) catalyzes powerful transformations in the experiencer. Many times there is a miraculous healing from the NDEr's injuries or illness. With the insights and understanding of their life purpose, there is always personal growth and spiritual transformation. NDErs frequently find they have the gift to heal others, and the message and insights of the NDE can soothe and comfort grief from the loss of a loved one. The profound message of love from the NDE can bring about transformation for all of us. 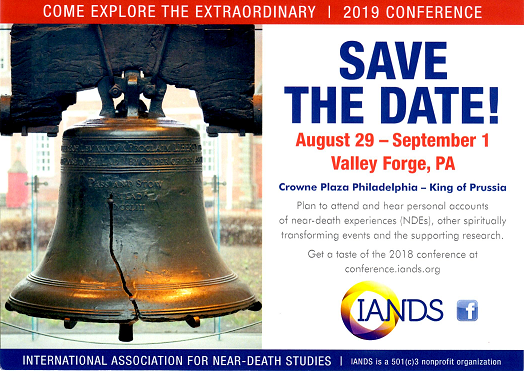 We are accepting presentations on this theme from the perspectives of near-death experiences (NDEs) and other near-death related phenomena, such as shared-death experiences (SDEs), nearing death awareness (NDA), deathbed visions (DBVs), after-death communications (ADCs), etc. Presentations from the viewpoint of experiencers, science and spirituality are welcome. Promote disclosure, description and classification of the phenomena associated with NDEs and related experiences that involve miraculous healing, inner or spiritual transformation, profound insights, the gift of healing and other aftereffects. Identify practices and insights that may help those in the healing professions (doctors, nurses, hospice, chaplains)to support NDErs and others with spiritually transformative experiences. Identify practices and insights derived from near-death related phenomena that may support and comfort those experiencing grief and loss. Compare and contrast insights from near-death related phenomena as viewed from the experiencer, scientific and/or spiritual perspectives. Discuss recent research on near-death related phenomena and associated experiences. To submit a conference presentation proposal, download the following documents. Using the EXAMPLE file as a guide, fill out the Conference Proposal Form and e-mail or mail it to the IANDS Office.